Remember when your teacher used to say “If you’re going to eat that, make sure you have enough for the rest of the class”? 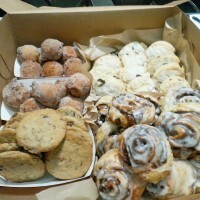 With just 2 days notice you can pick up an office sized box of fresh baked pastries! We have our cinnamon rolls, cookies, scones, bacon fritters, and more. $20 per (non-mixed) dozen!